The candidate must have BSc. Environmental Science and Management or BSc. Environmental Engineer­ing with GPA of at least 3.8 and a minimum score of B+ in the relevant subjects or its equivalent. The candidate must have BSc. in Chemistry and Biology OR BSc. in Biology and Chemisty with a GPA of at least 3.8 or above and a minimum score of B+ in the relevant subjects or its equivalent. The candidate must have BSc. in Building Economics/Construction Management/Quantity Surveying with a GPA of at least 3.8 or above and a minimum score of B+ in the relevant subjects or its equivalent. The candidate must have BSc. in Geomatics/Geoinformatics/GIS and Remote Sensing/Land Surveying with a GPA of 3.8 or above and a minimum score of B+ in the relevant subjects or its equivalent. The candidate must have BSc. in Land Management and Valuation with a GPA of at least 3.8 or above and a minimum score of B+ in the relevant subjects or its equivalent. The candidate must Bachelor of Accounting/Finance and with a GPA of at least 3.8 or above and a min­imum score of B+ in the relevant subjects or its equivalent. The candidate must have BSc. in Transport Engineering/Highway Engineering/Civil Engineering (Trans­port) with a GPA of at least 3.8 or above and a minimum score of B+ in the relevant subjects or its equiv­alent. The candidate must have BSc. Urban Development Planning/ Regional Development Planning with a GPA of at least 3.8 or above and a minimum score of B+ in the relevant subjects or its equivalent. The candidate must have BSc. in Urban in Land surveying/ Geomatics with a GPA of at least 3.8 or above and a minimum score of B+ in the relevant subjects or its equivalent. The candidate must have BA. Sociology/Community Development Studies with a GPA of at least 3.8 or above and a minimum score of B+ in the relevant subjects or its equivalent. The candidate must have BA. Development Studies from a recognized University with a GPA of at least 3.8 or above and a minimum score of B+ in the relevant subjects or its equivalent. Candidates pursuing Masters Studies in relevant field will have an added advantage. All applicants should indicate in their application letter post, the name of the School and Department to which they are applying. Applicants who are currently employed by Public Institutions should channel their applications through their respective employers. Applications should reach the University by using the address havelow not later than 08th February, 2019. 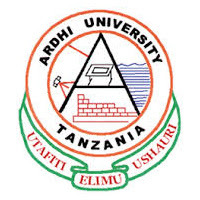 Advertised vacancies can have obtained from Ardhi University Website aru.ac.tz.